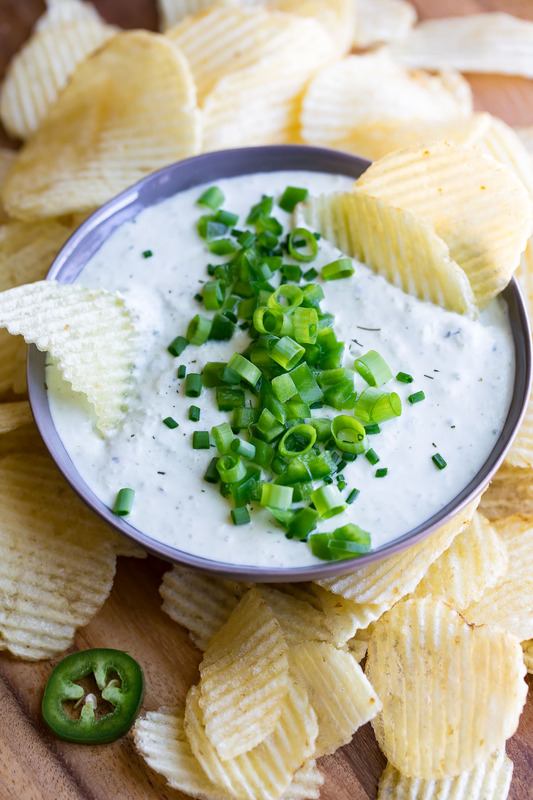 Jalapeño Tzatziki Dip is ready to rock your next party or potluck… or just revolutionize your current snack status, NBD. This delicious dip always leaves us coming back for more! In honor of the impending Jalapeño smorgasbord I’m about to experience in my little backyard garden this time of year, I’ve decided to start jalapeño-ifying (pretend that’s a word) all my favorite recipes. 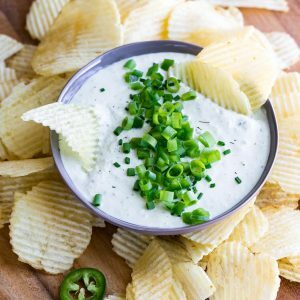 Because ranch dip is loaded with mayo (and frankly so last season) I decided to jazz up my go-to tzatziki dip recipe and make and epic bowl of jalapeño tzatziki dip. Ohmygosh guys, get ready to want to lick the dang bowl clean. It’s so good and 100% a new staple in the P&C household. We love it with warmed pita bread and crunchy chips (pita chips, ruffles, tortilla chips.. they’re all amazing!) for an easy peasy appetizer or snack. It pairs marvelously with my Mediterranean Bruschetta Hummus Platter and would be equally awesome dolloped on these healthy potato skins. 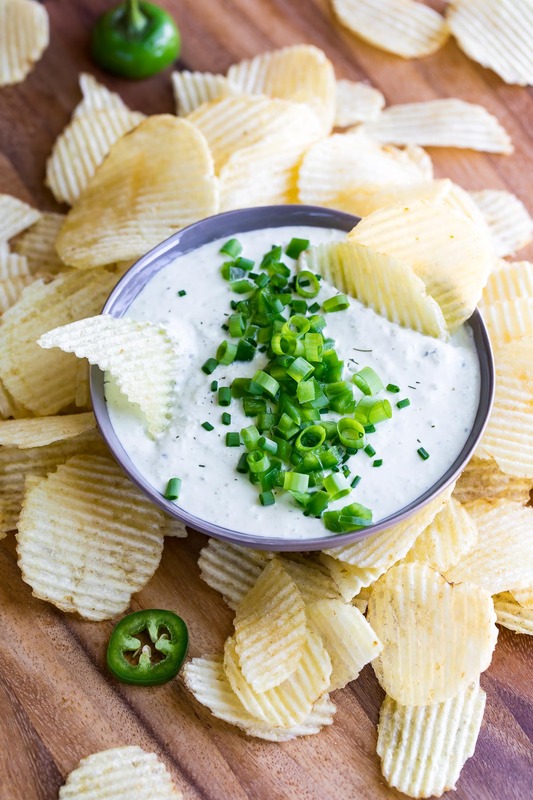 This zesty jalapeño tzatziki dip also makes an excellent sauce! Try it over your favorite chicken or fish dish or whip up a fluffy gyro sandwich and use this in place of traditional tzatziki sauce. You can even mix in a little feta to take things to the next level. I’ve tried it like this and adore it every which way. We blended its and served it with pizza last week (for dunking the crust of course) and I may have actually died of deliciousness. Paul and I straight up devoured it and immediately longed for more. It was so flipping good! This recipe yields approx. 2 cups of dip/sauce. Throwing a party? Feel free to double or triple this crazy easy tzatziki dip as needed! It comes together so fast and is full of flavor. The cucumber-garlic-lemon-jalapeno combo seriously wows me every time! Jalapeño Tzatziki Dip is ready to rock your next party or potluck... or just revolutionize your current snack status, NBD. This delicious dip always leaves us coming back for more! Spoon your yogurt into a medium bowl. Using the coarse side of a box grater, grate the English cucumber into shreds and give the pile a rough chop. Pat dry with a few paper towels and sprinkle with a teaspoon of salt. Let it sit while you prep the rest of the ingredients, as the salt will help draw out liquid from the cukes, giving you a thicker dip. Remove the seeds and stem from your jalapeño, setting aside as many seeds as you'd like to add back into the dip to control the spiciness. Mince the jalapeño and garlic. Smash a pinch of salt into the garlic to season and add to your yogurt. Next add 2 tablespoons of lemon juice, dill, garlic powders and black pepper. Place your shredded cucumber in a stack of paper towels or a clean dishtowel and wring out the liquid, Add to your yogurt and mix it all up! Allow to sit in the fridge for at least an hour or two before serving for best flavor. If you'd like, you can add any additional seasoning to taste too. Have fun with it! Dip may be made in advance as it's great the following day and will keep for approx. four days in the fridge. For a thinner sauce/dip, blend the entire mixture in a food processor or with an immersion blender until smooth and creamy. Enjoy! The jalapeño seeds control the heat here so skip them for a milder dip, add a little for a medium zing, or pile them all into your dip for a fiery snack! * I find that regular Greek yogurt (not non-fat) tends to be much creamier in this delish dip! I used two 7 oz containers for my dip. I've also tried it with half sour cream and half non-fat yogurt and it was super yummy too! If you get a chance to try this zesty jalapeño tzatziki dip, let me know! Leave some love in the comment form below or tag your photos with @peasandcrayons on Instagram so I can happy dance over your creation! Definitely going to have to try this out! Love switching out recipes that are mayo based for greek yogurt and the zip of a jalapenos is perfect! This looks SO good! I cannot wait to try it! I will probably have to double it because my family will be inhaling this goodness! This is brilliant to make to dip pizza in! Why have I never thought of that! I can hardly keep my spoon out of it though… I hope there is enough for the pizza that Im ordering later tonight. Its so hard though… its fresh, creamy and I love the addition of the jalapenos for the zing I ALWAYS love in anything! So glad you’re enjoying it Michele – thank you! !